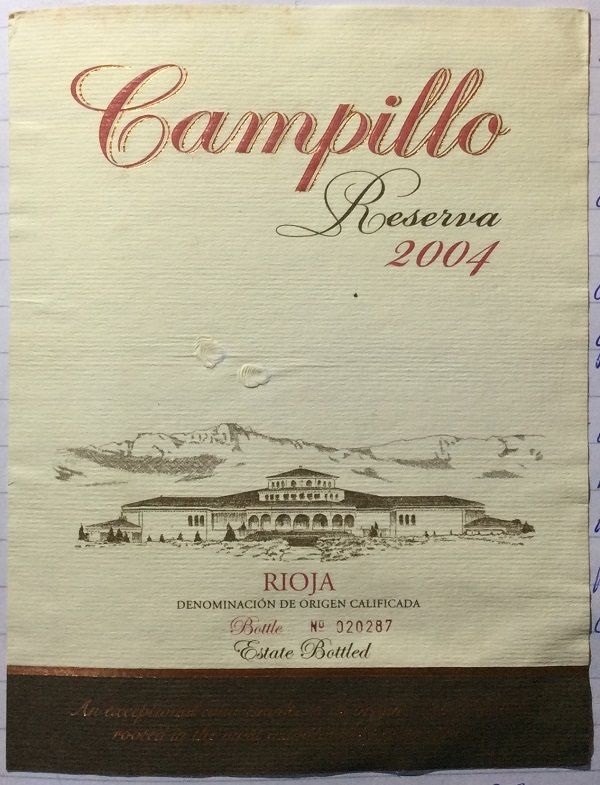 Confirming the quality of the 2004 vintage once again, this is a good quality, and at the price, good value Rioja. Deep ruby colour with a narrow, watery rim. Medium+ intensity nose: espresso, black pepper, smoky / coal, dark chocolate, oak-spice and black cherry fruit. Rich, sweet fruit, but savoury overtones. Concentrated but balanced. Still quite primary. Vanilla touches. Meaty, mushroom hints emerge. Rich, medium-full bodied, with a warming alcohol touch. Medium acidity balances body and sweet fruit. Concentrated, intense kirsch, sour cherry and pepper spice. Once opened, medium+ tannins fade into the background, but this still has 5+ years. Warm, pepper-laced finish. Will see what the second bottle holds!